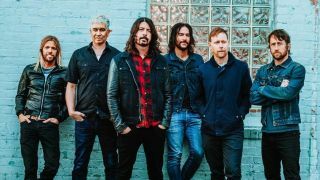 Foo Fighters have released another song from their upcoming album Concrete And Gold, the follow-up to 2014’s Sonic Highways. The Line, an uplifting chunk of melodic rock with guitars that chime in traditional stadium-filling fashion, is the third track to be released from the album, following earlier videos for The Sky Is A Neighborhood and Run. The album was produced by Greg Kurstin, who has previously worked with the likes of Adele, Sia and Pink. The choice was made after Dave Grohl first heard Again and Again by Kurstin’s band The Bird & The Bee. “It blew my mind,” says the frontman. It was so much more sophisticated than anything I’d ever heard and I became obsessed. Foo Fighters play London’s O2 Arena on September 19 in an event celebrating the venue’s 10th birthday (full tour dates below). Concrete And Gold can be pre-ordered now.